“Nuggets of Gold” is intended to pass on treasures of information that I or others have gleaned along life’s journey.I get the most out of life when I am using the gifts God gave me. Whether it be painting, writing, film, sewing, gardening or photography, that’s what makes me happy. I do “avoid the watercooler gang”. I am a bit of a risk taker. What better way to share these treasures than by blogging…. 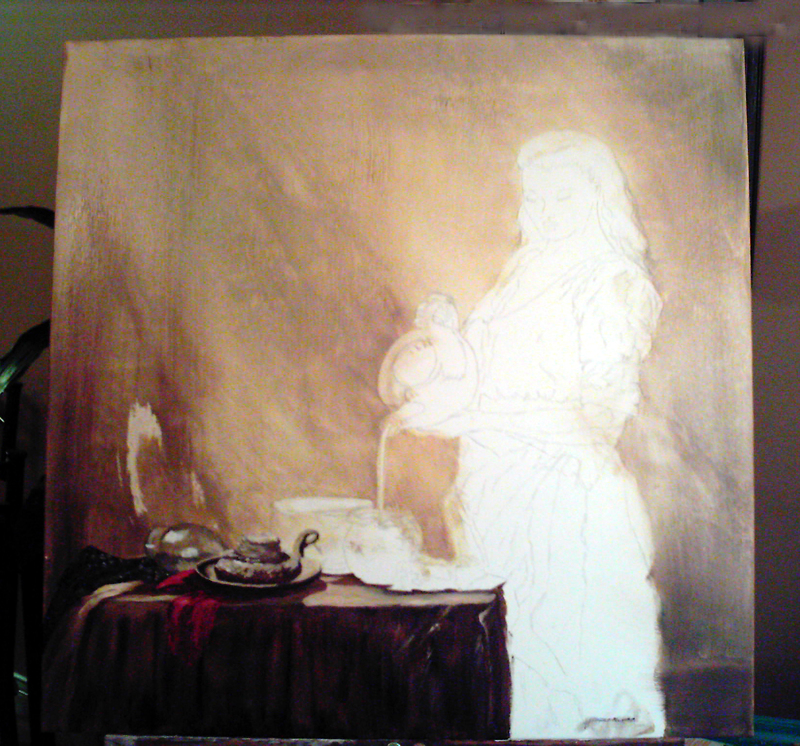 and like the unfinished canvas on the right, this is a process and an ongoing conversation. this is great blog, nice article….. Thanks for visiting and commenting. You have a great blog yourself. I’ve bookmarked it. Love the “Mennonite Milkmaid” painting! I can really relate to your blog! Please visit mine at http://AnfinsenArt.blogspot.com I think we have a lot in common! We are both writers and artists. Thank you for visiting my blog and for your comments. I enjoyed your beautiful paintings and short stories. Yes, we do have lots in common. I look forward to more of your entries. 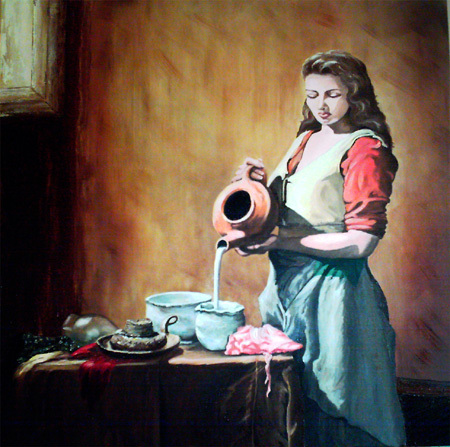 Another of my oil paintings on the heritage theme is called “Mennonite Washerwoman” This piece I sold this year and so am looking to paint another on the washerwoman theme. This piece was inspired by my mother who was the eldest of 9, did all the laundry, and loved it! So beautiful, Carrie. Love your style! Did you have a model, or did you use old photos plus memory? Yes, I used old photos plus memory. I researched the type of basin my mother might have used. I knew what I was looking for – my mother still had her old washboard before she moved to a Care Home. It’s just like the one in the picture. It was a lot of fun to research and paint. My mother of course was pleased. My mother loved to do the laundry. She would have to get it done before she could go to school. She took pride in having the brightest, whitest laundry in town. This taught me something very important. She took what life handed her and made it something beautiful. Many times I use a model. Sure, what would you like me to blog about?